HARD WORK is a high-intensity pre-workout formula designed for individuals who are looking for a serious product that works as hard as they do in the gym. 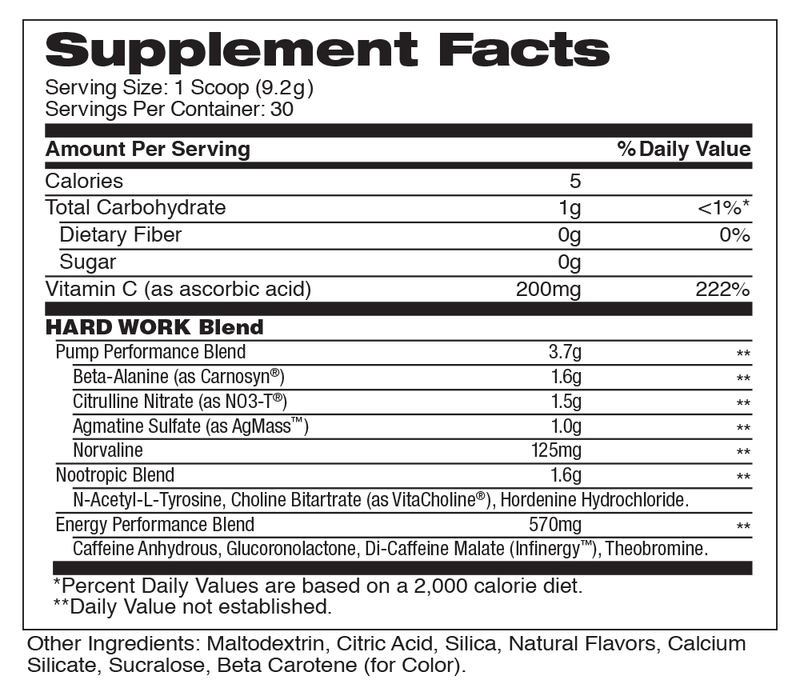 Among other cutting-edge ingredients found in this powerhouse formula, HARD WORK also utilizes a unique combination of 5 patented compounds which ensures you are getting a selection of some of the most sought-after pre-workout ingredients available today! SUGGESTED USE: As a dietary supplement, mix 1 scoop in 6–8oz. of cold water, 30 minutes prior to your workout. Due to the strong nature of this product, begin with a 1/2 scoop to test your tolerance. WARNING: Contains 339mg of caffeine per serving. This product is only intended for healthy adults, 18 years of age or older. Keep out of reach of children. Please consult your physician before taking if you have any pre-existing medical conditions or are taking any medication. Do not use if you are pregnant or nursing. Do not use if you are sensitive to caffeine or other stimulants. Contains 1.5g of nitrates. Do not use if you are taking nitrates for chest pain, medications for erectile dysfunction (such as PDE-5 inhibitors), or other nitrate-containing dietary supplements. Do not exceed the recommended dosage of this product. Discontinue use and consult your health care professional if you experience any adverse reaction to this product. Do not use if safety seal is broken or missing. Store in a cool, dry place. Packed by weight not by volume, settling may occur.